How Often Do I have to Replace the Light Bulbs on My LED Shelf? Lights. The thing we turn on every morning, but ironically have very little knowledge of. In recent years, the increase in different types of lights bulb has led to many people not understanding the length of time these bulbs ( especially LEDs ) will last. One of the most frequently asked questions that we get at Armanda Productions is “How often do I have to replace the bulbs in my shelf?" We understand how this can be a confusing question for many first-time buyers, as the average consumer may not be well versed in the world of “light bulbs.” And that’s to be expected. Your typical incandescent bulbs last anywhere from 1,000 to 2,000 hours. The bulbs we use however are LED bulbs which run upwards of about 50,000 hours. Our LED bulbs contribute to a long shelve life for your bulb and a reduction in overall power used to create the same amount of light, is what makes this technology so promising. If the phrase LED sounds familiar, that's probably because they tend to be the type of bulb found in consumer lamps, which typically run for around 20,000 hours. And unlike those typical incandescent bulbs, LED bulbs don’t “burn out.” Instead they just fade away. That’s because LED lights start to dim the second they are connected to a power source, so they will gradually get more dim over time. Now LEDs do start dimming the minute you turn them on, so they will eventually get dim. But don’t fret. We have intentionally and uniquely build our LED liquor shelves to accommodate bulb changes so the transition is as hassle-free as possible. 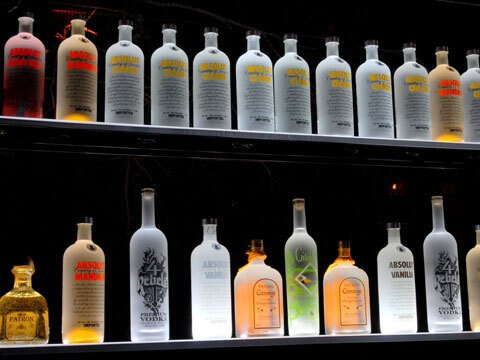 Many of our consumers would be surprised to know that the LED bulbs that we use in our LED liquor shelves last upwards of 50,000 hours! We do this to help minimize the amount of upkeep that is required for your LED liquor shelf. Once you receive your LED bar shelf, all you have to do is plug in the cord into any standard wall outlet...and watch the room light up around you.